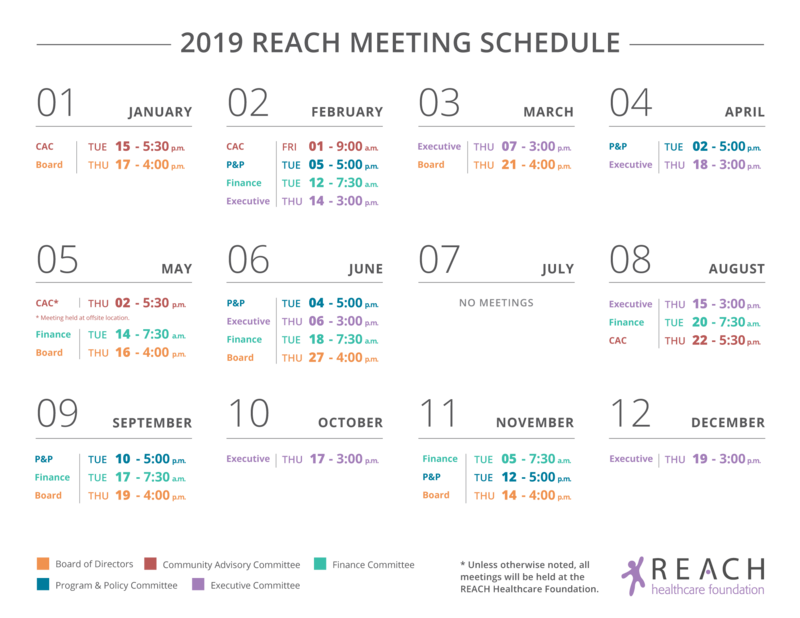 Each year, the REACH Board selects members who reside within the foundation’s service area to fill seats on the 17-member board. Nominees can be identified in several ways. The REACH Community Advisory Committee leads this process by identifying individuals with community and board governance experience, and an understanding of and commitment to health issues. Board members also seek out potential applicants, and the foundation issues an annual public notice of the process and timeline for accepting applications. Applications for 2019 will be accepted in the fall with a deadline of November 29, 2018. Interested individuals are encouraged to contact REACH President and CEO Brenda Sharpe for additional information on the nominations process. ARE YOU INTERESTED IN JOINING THE REACH BOARD? Click on the link to the right for the application form. The Community Advisory Committee (CAC) is a governmentally appointed 13-member advisory body charged with identifying and nominating qualified candidates for the Board of Directors. CAC members reside within the foundation’s three Kansas counties. Members are appointed by the Kansas Governor and Attorney General, and the county commissions for Johnson, Wyandotte and Allen counties. CAC members are appointed for three-year terms, and are eligible to serve up to two consecutive terms. The Foundation’s governance practices are described in a set of documents, including Guiding Principles and Core Values, Bylaws and Board member responsibilities. Read more about how REACH strives for transparency in its governance and operations as a participant in the Foundation Center’s Glasspockets project. Contact us with questions and to request information from prior years.